Piecewise Function: a function that is defined differently over more than 1 subdomain. A piecewise function is a function that consists of multiple sub-functions, each applying to a different domain. An example of a piecewise function is . In the piecewise function , there are two domains: x<0 and x≥0. When x<0, the value of the function is x2. 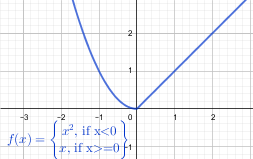 When x≥0, the value of the function is x.
McAdams, David E. Piecewise Function . 12/21/2018. All Math Words Encyclopedia. Life is a Story Problem LLC. http://www.allmathwords.org/en/p/piecewisefunction.html.